Pretty much stuck to plan last week, the hubs is away for 2 nights this week so going freezer diving again! My veggie versions in brackets if different! Italics indicate something from the freezer. 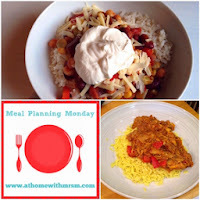 Tuesday - chip night, hubs home too. Sunday - chicken kiev, smashed potatoes & lemon and honey carrots recipe coming next week! 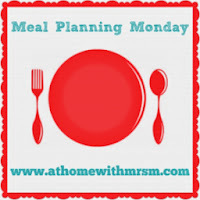 This post will be linked to Meal Plan Monday at athomewithmrsm.blogspot.com a lovely little community of homemakers and a fabulous resource for meal ideas.